I spoiled myself last weekend and bought another Blue Apron box. The menu was cod with fingerling potatoes and radishes in a tamarind butter sauce, fennel rubbed pork with grapefruit segments and black rice, and chicken and soba noodles in a peanut sauce. The pork was my favorite. 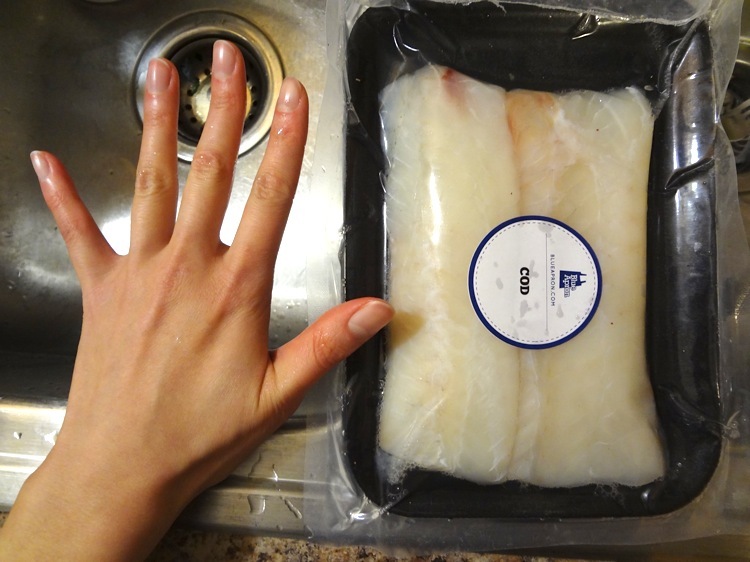 The cod was good but could have been better. That’s my fault though. I didn’t brown the butter enough. (Note to others – Do not brown butter in a dark colored pan! It’s really hard to tell when it’s done!) The chicken was ok. I’m not a peanut sauce fan (I wonder how an almond butter sauce would do), and I thought there was not enough sauce for the amount of noodles provided. Having said that though, I was still really happy with my Blue Apron box. There’s nothing wrong with splurging $60 on myself from time to time. There’s no picture of the cod because I had cooked it late in the evening. Reminder – I’m not getting compensated for this post in any manner. 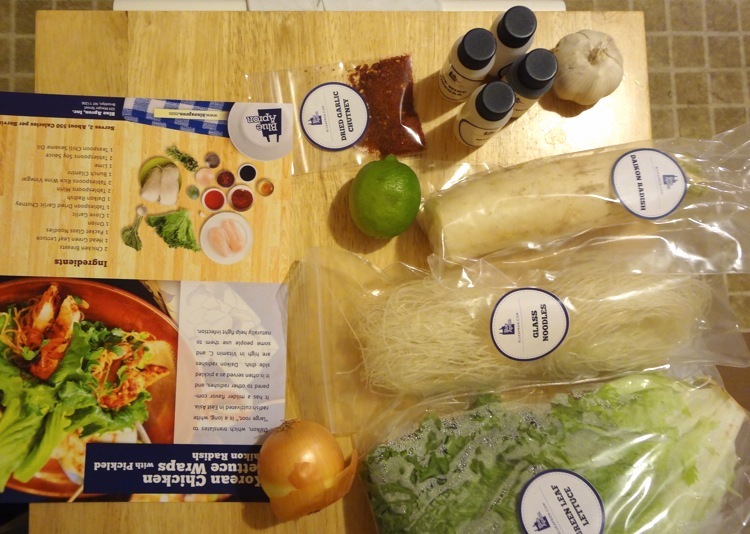 I shelled out the money from my own pocket just to try out the Blue Apron service for fun. 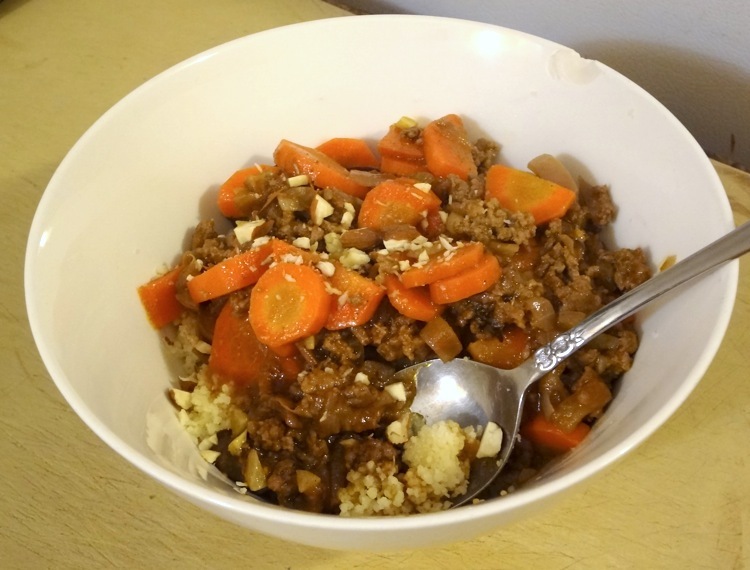 My last Blue Apron meal was Moroccan Beef Tagine with Dates and Honey. It was a sweeter recipe than I expected it to be. 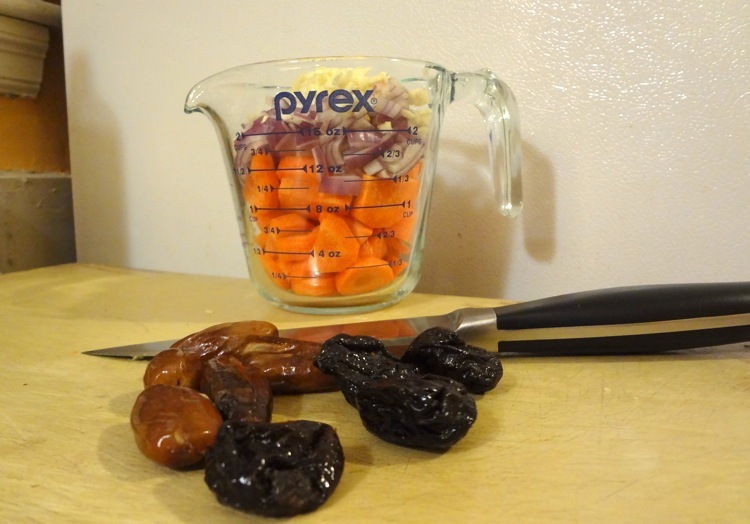 With the prunes and dates, I’m not really sure the honey was needed but I guess that’s more of a preference. I tend to think tagines should be highly spiced in flavor. I took a little longer cooking this dish because I wanted my carrots to be soft-ish. 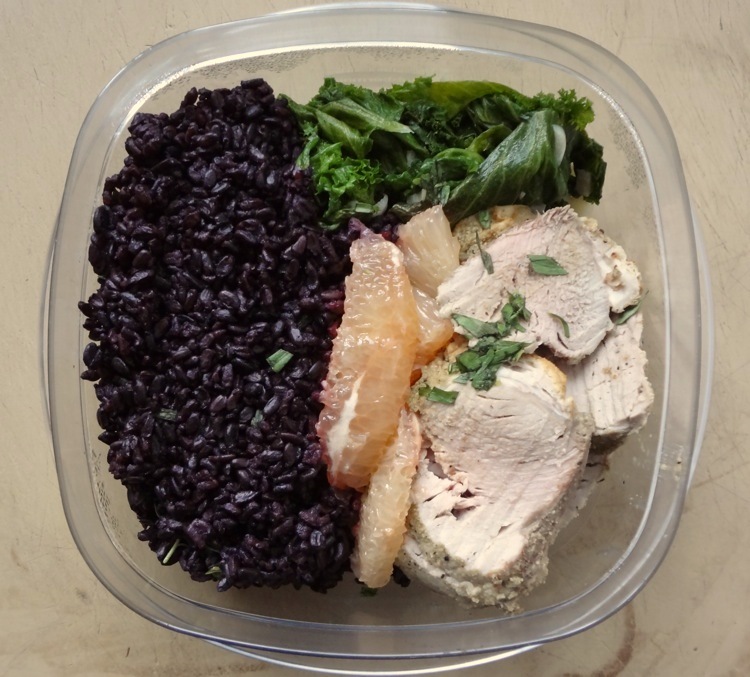 Anyway, my overall impression of Blue Apron is quite favorable. Cons: If you don’t live in Manhattan, then your box is shipped to you via FedEx. You are at the mercy of FedEx. As sad cat macro from an earlier post indicates, I was not having fun with this. Unfortunately, Blue Apron doesn’t automatically notify you of your FedEx tracking number. Fortunately, Blue Apron does respond to their emails and we were able to track my shipment pretty easily. The only other thing that I don’t like about Blue Apron is that, technically, it’s a subscription service. It will automatically charge and ship me boxes if I don’t opt out of that week. You can cancel your account at any time, but, as a general rule, I don’t think you should have to opt out. I think it’s a better practice to have customers to opt in. 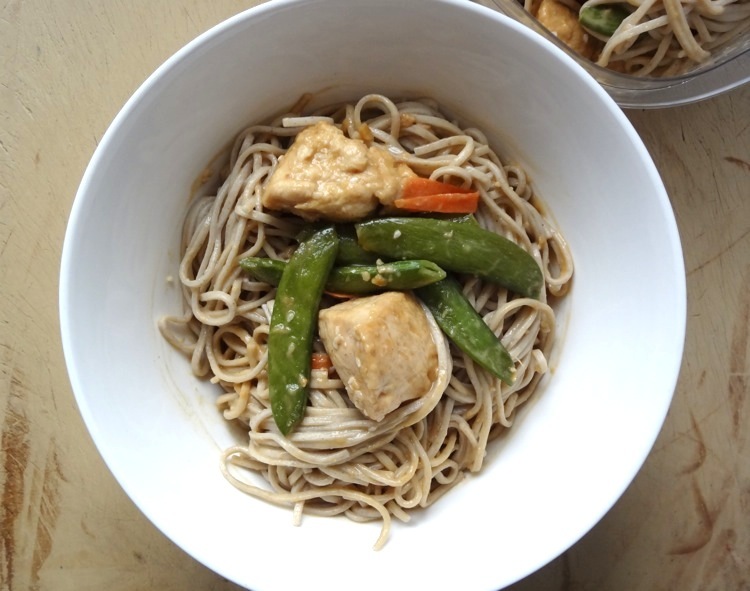 And for picky eaters (which is me sometimes), Blue Apron notifies you a week ahead what the next menu is. So, if you don’t like it, you have some wiggle room to opt out (or opt back in if you do like it and you had already scheduled to skip a delivery). So, I’m going to keep my account for now. It’s not something I’m going to do every week, but maybe once a month? We’ll see. I’m also wondering if I should change my delivery date from Wednesday to Friday, but I’m not sure if that’s any better for my schedule if there’s a late delivery again. Moving on! 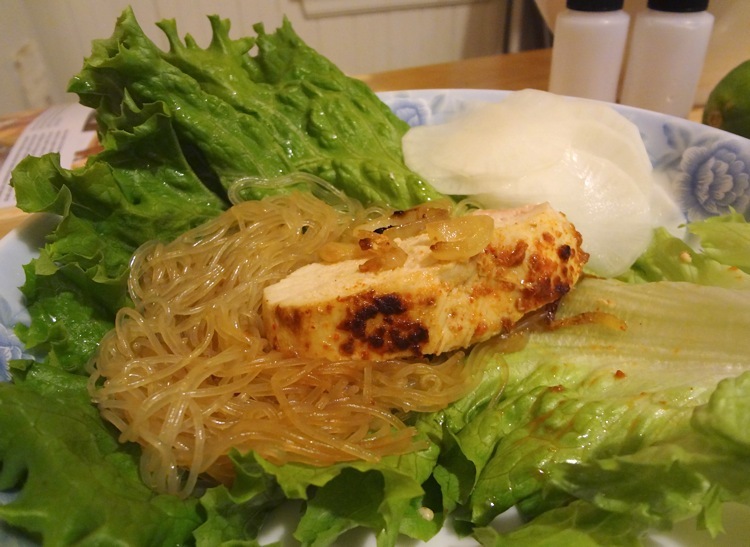 The recipe I decided to make on Friday night was Korean Chicken Lettuce Wraps with Pickled Daikon Radish. Not pictured were two nice free range chicken cutlets supplied by Pat LaFrieda Meat Purveyors. This recipe, like the last one, took me about 35 minutes to make. It probably could have taken me less time, but I had no need to rush. The minor changes I made were to 1) salt the chicken beforehand, 2) use shio koji instead of salt for the daikon radish, and 3) thinly slice the daikon with a mandoline. The original recipes tells you to cut the daikon into chunks, but pickled daikon in Korean restaurants is usually cut in julienne strips (I’m not referring to radish kimchi which is cut into chunks). So, chunks didn’t feel right to me. Plus, I just couldn’t imagine that the daikon would get enough flavor in half an hour from its marinade. What else? Ah, the unusual ingredient in this recipe was dried garlic chutney. It really had me confused at first. There’s no such thing as dried garlic chutney in Korean cooking. Sure, there’s a lot of garlic and red pepper flakes but no spice mix referred to as dried garlic chutney. After some researching and an quick confirmation from Blue Apron, dry garlic chutney is spice mix found in Indian cooking. It’s spicy enough and familiar enough, I think, for Korean approval but the flavor is still ever-so-slightly foreign. So, this dish is more Asian fusion and not traditional Korean. Reactions? I really liked this one, especially the glass noodles. The noodles reminded me of a Chinese vermicelli dish my mom makes. I’m not totally sure what kind of glass noodles they were though. They’re too thin to be chapchae noodles. It’s probably just a Korean version of the vermicelli I’m familiar with, but I’ll have to start looking for them. It’s hard for me to find Chinese vermicelli that I like. The past few years, I’ve been buying a Taiwanese brand, but it’s getting harder and harder to find it. I can only find mainland Chinese brands. I like the Taiwanese brand better because it’s generally softer and chewier. I wonder what it is that creates the texture difference. Technically, they are supposed to be the same product. The radish was good too. Not as sour as I normally expect, but it was a nice foil to the spiciness of the chicken. And yes, the chicken was fairly spicy hot even though I did not use the full amount of chutney provided. 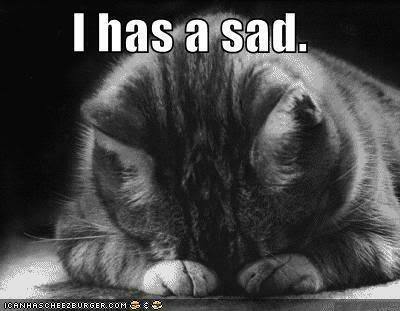 I must admit – I’m a little sad that I’ve only got one meal left to cook. I got all excited. My first Blue Apron delivery was dated today. For anyone who needs more details, Blue Apron is a online vendor that offers grocery delivery centered on healthy cooking and cooking experimentation. A one-week subscription gives you all the ingredients you need for three meals (two servings each) and recipe cards for the meals. The meals seem to be fairly well balanced by the look of their past recipe cookbook, and I think each serving is under 700 calories for those who are counting. Do you see where this conversation is going? I came home to nothing. Not-a-thing. And I checked again as I started to get ready for bed, on the barest hope that maybe I had come home too early and my box had been delivered late. Still, zilch. Ugh. I sent Blue Apron an email just a few minutes ago. Hopefully, it can be resolved in a quick and friendly manner. I’m more upset that this means I have nothing for dinner tomorrow or Friday. (I was lucky and had just enough backup food for dinner tonight.) And I was really looking forward to cooking something new and fresh. Instead, I get to go to bed with a disappointed tummy.